As I mentioned in my last post, I’m in love with the Heidi Swanson cookbook, Super Natural Every Day. This lovely little snack is straight from her book, with a Trader Joe’s-loving twist: I bought my dukkah pre-made. Sacrilege, I know! And while Heidi’s recipe for homemade dukkah is lovely, I couldn’t pass up a high-quality shortcut for $2.99. 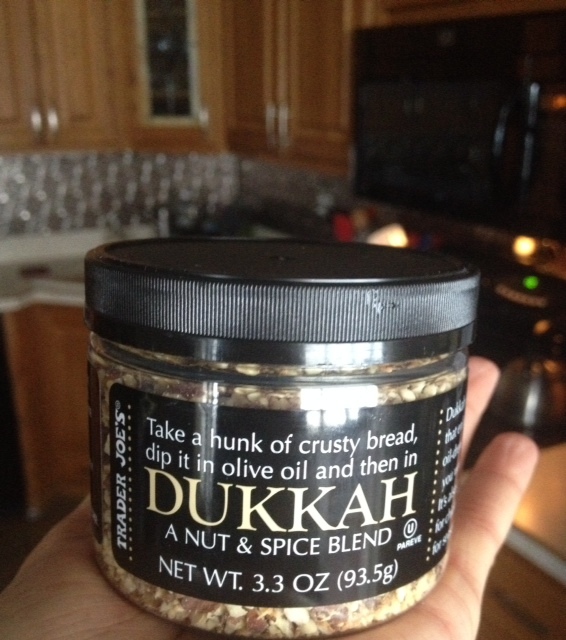 Dukkah is an Egyptian seasoning blend made of nuts and spices, and is often mixed with oil and used as a delicioud bread dip. 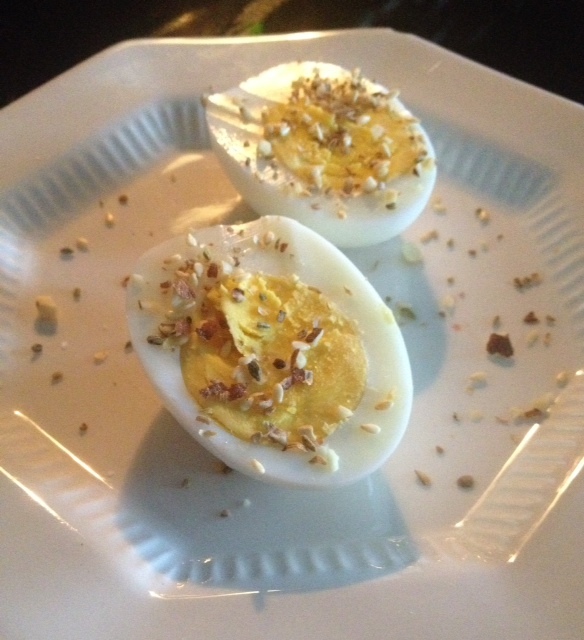 Heidi suggests drizzling a hard-boiled egg with a bit of olive oil and sprinkling with dukkah as a quick and flavorful snack. This idea has been tantalizing me for months and when I found my jar of dukkah at TJ’s, it was game on. This is much less a recipe than an idea and an inviting way to try a possibly unfamiliar spice blend. So, let’s talk hard boiled eggs and have a snack, shall we? My foolproof method for hard-boiling eggs is this: place your eggs gently into a pot and cover with cold water, bring to a boil, cover with a lid and remove from heat, allow to sit- covered- for 15 minutes. When 15 minutes is up, float the eggs in a bowl of ice water before peeling. This will prevent those icky green rings around the yolks. Peel, cut an egg in half lengthwise, drizzle with a bit of oil and sprinkle with dukkah. Delicious! This entry was posted in Breakfast, Classics, Easy, Eggs, Fancy, Fast, Gluten free, One Pot, Quickie, Snack, Vegetarian and tagged dukkah, egg snack, eggs with dukkah, healthy snack recipe, how to hard boil eggs. Bookmark the permalink.